Easy Tie Dye Art with Baby Wipes - I Can Teach My Child! We recently discovered that baby wipes can be great for art! 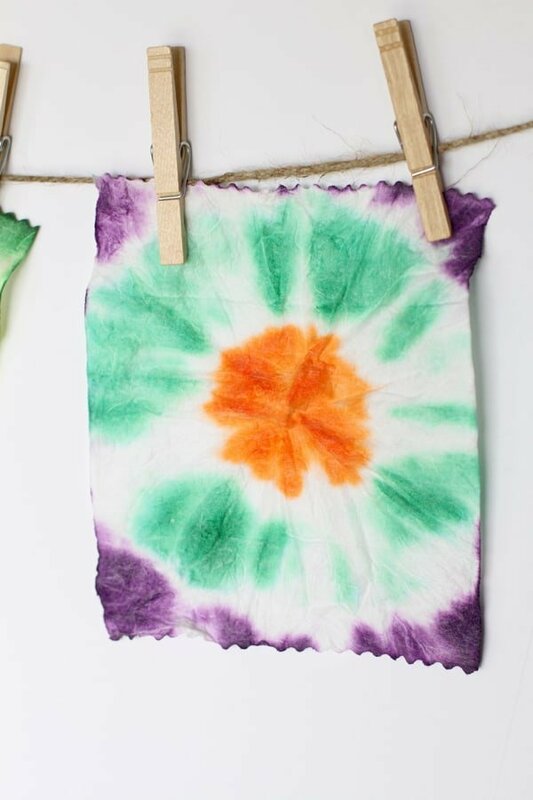 We used them to make some SUPER easy tie dye art with baby wipes that can easily be done with kids of all ages. No need to worry about stains and permanently dyed fingers…everything is completely washable! 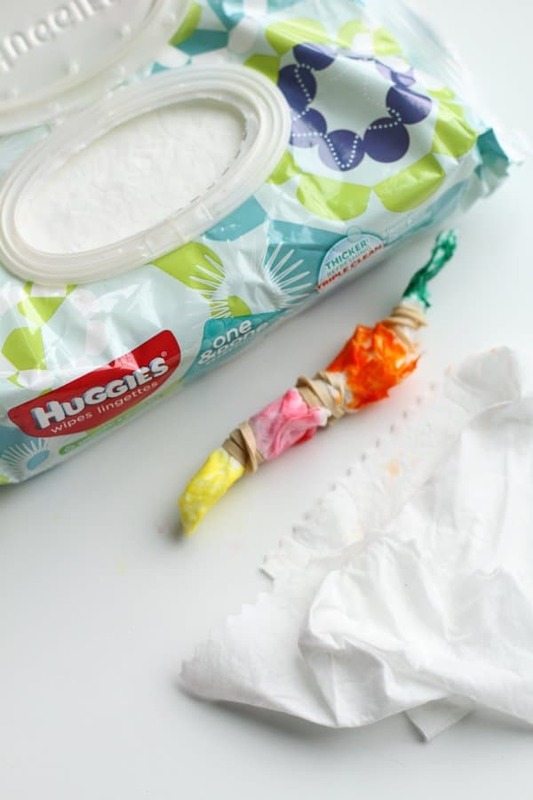 We especially love Huggies Wipes from Walmart for this project! Huggies Triple Clean layers are thick and hold up much better than other wipes we’ve tried. 1. 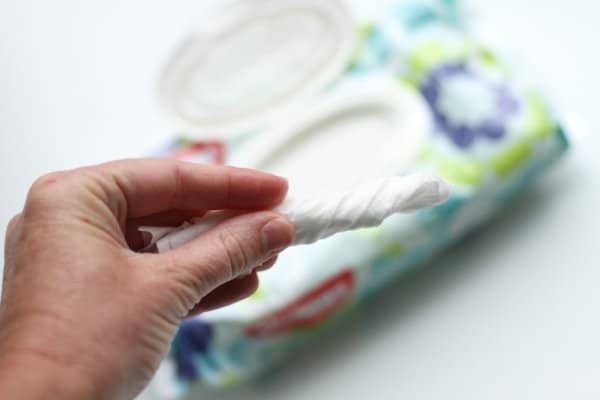 Pinch the center of the baby wipe and hold in your hand. 3. 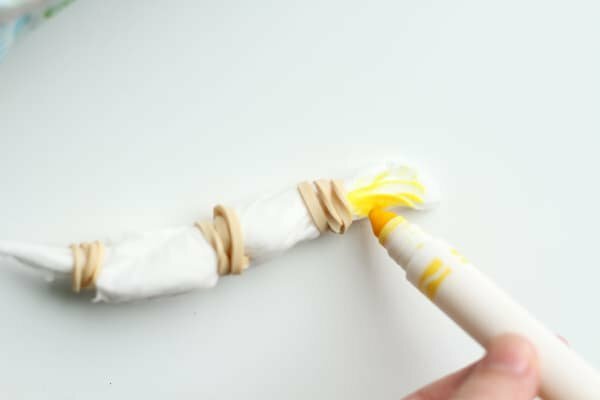 Carefully attach a few rubber bands and have your child use a marker to color the sections of the baby wipe. The more that the marker gets into the folds, the more vibrant the color will be. You can also use your liquid watercolors to gently drip color onto the sectioned wipe. Just make sure you do it over the sink. I found this made for a more richer color. Continue using other colors of markers to complete the tie dye baby wipe. Not pictured: Remove the rubber bands, gently unfold the baby wipe and lay on top of two pieces of paper towel until it has completely dried. Use the tie dye baby wipes for any number of projects, including a SUPER EASY tie dye bunting! Last but not least, wipe up any stray marks with your remaining Huggies® Wipes. In what other art project can you use your canvas to clean up your mess?!?! What a fun way to tie-dye! Definitely more friendly for the younger crowd than the usual ways. I love how beautiful they turned out! This is an adorable idea! My uses the Pampers Sensitive, so I might be a little reluctant to try this (not cheap!) but I think I would try it out just the same. I found this @ http://affimity.com/#/sharedPost/2/9153 and I might have more fun than my little one making ‘art.’ It’s cute, it’s easy, and I know my little guy will love this activity. Thanks for the awesome idea! We had several makes of baby wipes on hand and for us the cheapest one by Purebaby bought from Aldi in Scotland (I know Aldi and Lidl are in many countries). gave the best effect and absorbed the colour well. It also gave us an excuse to use up the thousands of loom bands that inhabit my house, easier to put on and we could just cut them off. We liked the effect of multiple bands on one baby wipe. I have 3 grandchildren 7, 6 and 2, the oldest loved this but the youngest one coloured more of himself than the wipe. At least clean up was easy. We are now going to use the finished tie dye fabric as an overlay on dolly t shirts. I always knew that you could use wipes for more than one thing. I use wipes to clean my sneaker. It removes a lot of staines. Just finding this on Pinterest and will be trying with my 2 and 4 year old. Pinning! Thanks for the inspiration! Love this idea. I am going to do this with my granddaughter! The tie dye art using baby wipes is AMAZING! What a wonderful idea. I showed this to my kids and had them do this during our read aloud time. We used water dyed with food coloring and it turned out amazing. I guess if you don’t have baby wipes handy you could substitute coffee filters too. Thanks for such a fun idea! Thanks so much, Erin! Yes, we have done it with coffee filters too! Hello, may I use food coloring instead? Or gouache paint? Or any paint? Going to work with students next week. Need to know if I should pull the wipes and let them dry before the students try this art project????? No, I would not let them dry. The marker ink will run easier if the wipes are wet. Would a 5 year old be able to do this all on his own? 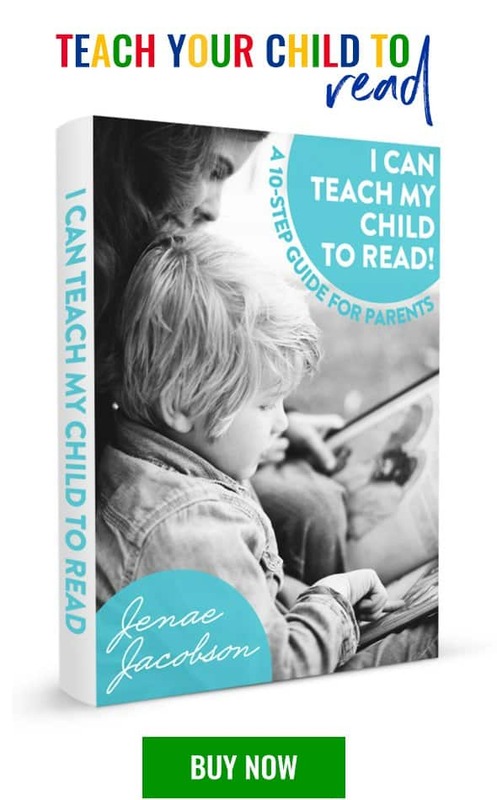 I would like to get help from you by downloading your free resources. Thanks this is great, I want a project for a 3 year old’s bday party that isn’t using real dye! This is such an awesome idea! I never would’ve thought of this.